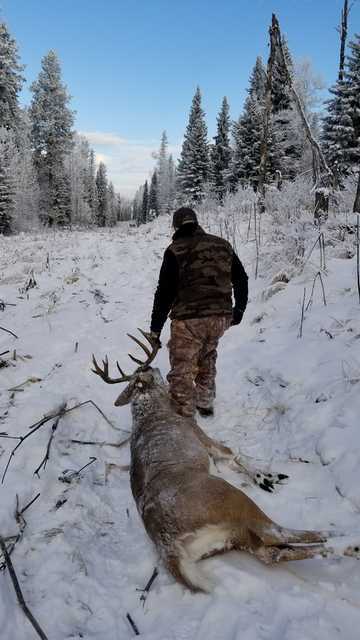 Hunting with Alberta Wilderness Guide Service (AWGS) has never disappointed me. I've had the opportunity to hunt multiple deer seasons with AWGS, and have future hunts already booked. Owner/Guide Dean Bromberger and his entire guide and lodge staff are professional, personable, and just plain good at what they do. They have become friends and I'm always looking forward to my next adventure with them. Another successful November hunt concluded in 2017 with the taking of my best Alberta buck yet. A large mature eleven point came out of the thick surrounding woods, startling the both of us as we seemed to sense and see each other's presence at the same time. It happened so quick, the entire scenario lasting but a few seconds. But that's how it usually happens in this diverse ecological terrain of thick woods and steep terrain. The first couple of days produced many sightings of respectable eight and ten point bucks, all within range of my comfortable blind, just to young to harvest. One true giant with a large body and rack came out about 300 yards distant silhouetted against the hill-top and sky, but I couldn't get him stop for further look-over and potential shot. 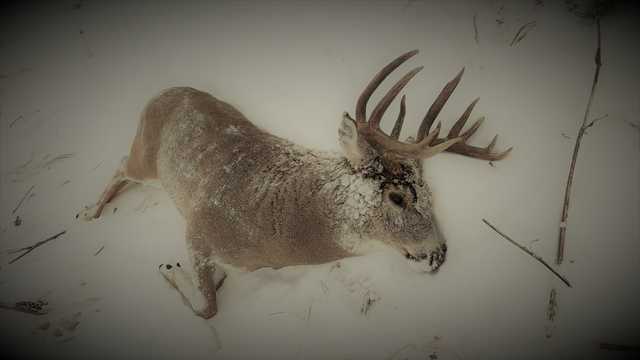 This big guy was on the heels of a hot doe and nothing was going to stop him. 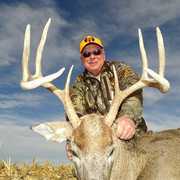 Many of the bucks encountered were responding to grunt calls and rattling. I had a few bucks come running in from as far as 400 yards away, and a few within 20 yards of my blind. My third morning of the hunt followed the same routine. 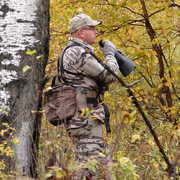 Shortly after sunrise and the woods came alive I gave a few grunt calls followed by a rattling sequence. Within minutes the buck I successfully harvested came out of the wood edge approximately 100 yards to my left. Startled he bounded towards the opposite wood line a mere 60 feet away. I immediately yelled loudly in an attempt to stop him, but that caused him to turn and run away from me. Quickly yelling again stopped him slightly quartering away at 150 yards. This gave me the moments needed to assess the maturity and overall size of the deer, and make a solid shot. I thought the deer had dropped in his tracks, out of sight on the other side of a small hump in the terrain. After about fifteen minutes I walked slowly to the spot where I last saw the deer standing, but no deer was in sight. However, I could see minimal signs of a hit and where he had crashed through the frost and snow covered woodwork. Not wanting to obscure any identifiable sign I backed away and contacted Dean. Within less than 30 minutes Dean was at my blind and together we tracked the deer which had piled up 30 yards from where he was last standing. After some celebration and picture taking we returned to lodge for the finish capping, and of course a few selective drinks around the campfire with hunting partner and friends. Great write up and what an experience!! 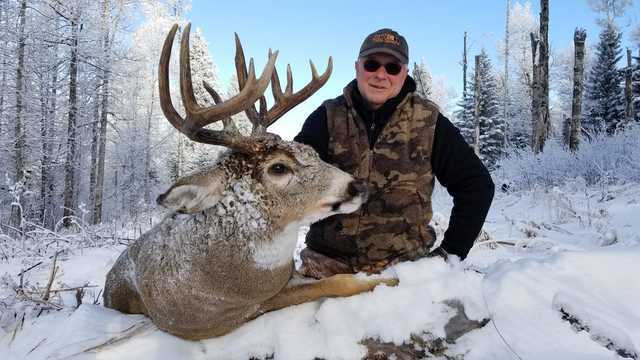 It was a great morning to be hunting Whitetails in Alberta and you were ready when this buck came out. Thanks for being such a great student of our operation and applying yourself so well at the moment of truth. As an outfitter, we are often measured strictly on harvests only, but there is so much more to this passion we all share...hunting. We have built many memories over the years, some ending with deer on the ground, and some without. At the end of the day, we create more memories as each hunt goes by and can truly appreciate the joy in the pursuit of big Whitetail bucks. Thanks for allowing us to share in those memories...can't wait to do it again soon!